US President Barack Obama has called for new ideas on the world’s seeming intractable problems. Well here’s one that could undermine the Taliban in Afghanistan without sending in more troops. The US and the EU should buy up all the poppies with government money. 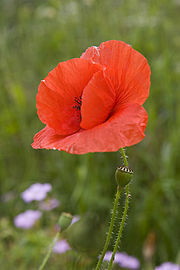 Buying the Afghan poppy crop was first suggested by the International Council on Security and Development. The idea would solve two problems in one blow. First, it would prevent the often-unwilling opium farmers from being driven into the arms of the Taliban for protection and as willing buyers and traffickers. Second, the crop could help the world, especially the poorer parts in Asia and Africa, with their chronic shortage of medical opiates. The Obama administration is gearing up to pressure the Europeans to put more men in boots on the ground in Afghanistan, but the Europeans don’t want to engage in a war of attrition – à la Russians in Afghanistan in the 1980s or like the United States in Vietnam a decade and a half before. There is nothing worse than having to pull out with your tail between your legs and confront the electorate with thousands of needless deaths of their brave young. The answer to this paradox is that the Europeans should use their soldiers to confront the issue of the Afghanistan poppy crop, which is responsible for 90 percent of the heroin sold in Europe, and funds over 80 percent of Taliban activity. This brings me to a memorable conversation I had in Islamabad with President General Pervez Musharraf two years ago (published in Prospect Magazine, March 2007). He suggested that the West should introduce a common agricultural policy on Afghanistan’s poppies – in other words, to do as both the EU and the United States do with certain agricultural crops – buy them up with government money. But poppies are useful in making opiates. Millions die each year in excruciating pain for want of relief. Death is bad enough, but to die in extreme agony is the most frightening thing a human being can face. India, Australia and Turkey (which was encouraged to do so by the Americans since 1974) are the only countries allowed to grow poppies under the supervisory authority of the World Health Organisation. Western countries buy most of these crops. Needless to say, there are many practical problems with this idea. If the price were set too high, it might encourage even more farmers to grow opium poppies. Besides, however high the price, some UN agricultural economists say that traffickers would simply outbid the government, safe in the knowledge that a majority of recipients – the addicts – would foot the bill. And if the price were not high enough, the farmers would continue selling at least some of the crop on the black market. Even if a premium did have to be paid, it would still be cheaper than the cost of new troops and an escalation of the war. But this ignores human nature, especially in an earnest Muslim nation where everyone – including the once anti-drug Taliban – knows that narcotics are strongly condemned by traditional Islamic teaching. Only desperation has driven most farmers to poppy production. All things considered, they would rather sell their crops to a government agency at, say, today’s going price, especially when they know that their product was going to help people in pain. Sartaj Aziz, a renowned agricultural expert and a former agriculture and finance minister of Pakistan, wrote to Prospect Magazine saying that he liked the idea of purchasing crops and that it should be tested on an experimental basis in one of Afghanistan’s poppy-laden areas. According to an article in last week’s New York Times by Bernd Debusmann, a forthcoming paper by former State Department official James Nathan, says the total cost of such a programme might be as high as $2.5 billion each year – not that much when compared with the $200 billion that the United States has already spent on the war (and that doesn’t factor in NATO’s contribution). Such a policy would be far more effective in undermining both the Taliban and Al Qaeda than any number of new troops sent in for combat. But let some of the troops arrive to help with the buying up of the crop, to make sure there are no secret, unofficial diversions and to police the districts that are in compliance. US President Barack Obama has called for new ideas on the world’s seeming intractable problems. Well here’s one. Jonathan Power is a veteran foreign affairs commentator based in London. This February 9, 2009, article is distributed by the Common Ground News Service at www.commongroundnews.org . What a wonderful soultion. And really so simple.